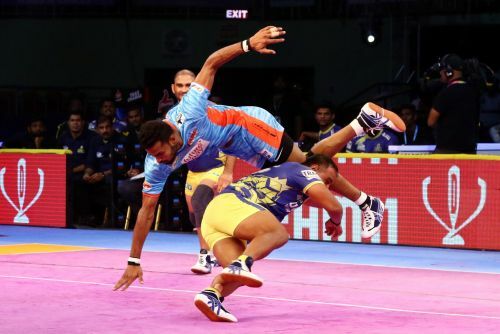 The Bengal Warriors got off to a flying start to the new Pro Kabaddi season with a convincing 36-27 win over the Tamil Thalaivas on the last day of the Chennai leg. The Thalaivas, playing for the fifth consecutive day could not hang on to the Warriors in the end after they yet again let slip a couple of glorious chances to jump into a good lead early on. Jasvir Singh returned to the starting seven for the Thalaivas and the veteran raider made a bright start, picking up 3 points in under 7 minutes. In fact, twice the Thalaivas managed to reduce the Warriors to just one player on the mat, but failed to affect the All Out, and even worse, gifting away costly points in the process. In the first instance, at 9-5 in the 8th minute, Mahesh Goud took a Bonus and a touch point while in the second, just two minutes later Rakesh Narwal took away 3 points. Warriors coach Jagdish Kumble spoke about that beginning: "Surjeet is our captain. He leads everything. He too made some mistakes and as a result, the team struggled. But you saw after that we came back." "We come prepared before the game on how to play if we're leading or if we're trailing", he added. Warriors skipper Surjeet was pleased with the win as he looked back on the game. "It was our first game of the season. I'm sure the flow will come as the season goes on", said Surjeet. He also feels that this year's squad is better equipped than last year's: "Our bench strength I feel is very good. We couldn't convert the chances we had last year, but this year they'll have to." For Tamil Thalaivas coach Edacherry Bhaskaran, it was a case of more frustration as defensive frailties combined with fatigue to put this game out of reach soon. Ajay Thakur had his quietest game thus far (6 points). "It looked like we'd cleaned up the mistakes from the previous three nights and had started well. But with one player on the mat, we allowed them again to get away. Our senior players made mistakes and in those crucial moments the game was lost", said Bhaskaran. Defeat left the Thalaivas with just one win and four losses going into the Sonipat leg. Bhaskaran, however, promised that he would get the team ready and in shape soon for them to make a playoff push.